﻿ Best Price on Legends Beach Resort in Negril + Reviews! This beachfront boutique hotel is less than 6.2 mi from Kool Runnings Waterpark. It offers free transfers to and free use of its sister facility with outdoor pools, scuba diving lessons and a full spa. A private patio carved into Negril's white sand beach is provided for each room at Legends Beach Resort. The rooms feature island decor and offer cable TV as well as views of the ocean or tropical gardens. Resort Legends Beach offers dining at its open-air restaurant. A beach bar also offers exotic cocktails and live entertainment is featured twice weekly. 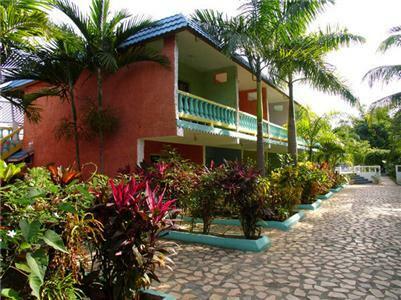 This bed and breakfast is about 3.1 mi from Negril Hills Golf Club and Negril Lighthouse. YS Falls is less than 1.5 hours’ drive away. The total price of the reservation may be charged anytime after booking. Please note that the tennis court is currently unavailable due to renovations. Please take into consideration the following requests: •	The credit card used to make the booking must be presented at check-in; •	One of the travelers must be the cardholder with a valid passport; •	Your accommodations cost will be charged at time of booking; •	Taxes will be collected at check-in using the same credit card used to make the booking; •	If the cardholder is not one of the travelers kindly contact the reservations team directly prior to arrival otherwise check-in may not be possible. • All room occupants must present a valid ID at check-in; • A refundable incidental deposit of $100 USD is required at check-in, cash not accepted. Guests are required to show a photo ID and credit card upon check-in. Please note that all Special Requests are subject to availability and additional charges may apply. A damage deposit of USD 100 is required on arrival. This will be collected by credit card. You should be reimbursed on check-out. Your deposit will be refunded in full by credit card, subject to an inspection of the property. oh my, if you have never been to jamaica i highly recommend you go! there are a few things i would have liked the reviews to tell me (or make more clear) so i will do that. garden view actually means across the road. the staff at the hotel was great! especially to note michael, beach security. he was the guy who would get your beach chairs and what your items while you weren't there. our housekeeper was martha, she was also great. out of all the places we went the staff at the hotel were by far the friendliest. it was a great location for things like restaurants, shopping (the time square duty free mall is literally next door), street food vendors and the mini mart. the beach was very clean as was the water. there was access to all sorts of water activities or boat tours (highly recommend orrick and captain clarke).